Naples; the city known for its disarray and chaos. And of course, Mount Vesuvius… One of the most dangerous volcano in the world sleeping behind the bay of Naples in peace and silence… The famous view and the symbol of the city… What about the opposite side of this spectacular view? You will be surprised with the beauty of Naples and the islands…. And with this opportunity you are also granted special permission to ride in the national park of Vesuvius, instead of taking the bus with all the other tourists! You will then embark on your relaxing tour, riding under the trees, passing by grape fields, climbing up ancient railways, following the way of lava, stopping by the volcanic rocks for a breathtaking view; and of course some pictures; and then galloping up the path and back…. Transfer from the hotel to the stable. 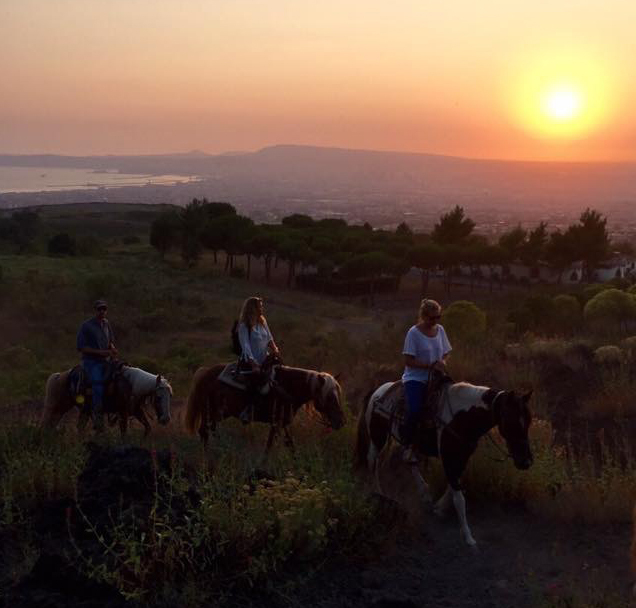 Horseback Riding Tour for around 2 hours and a half in the National Park of Vesuvius with an English speaking professional guide. Transfer back to the hotel. (if preferred, transfer back can be done to Pompeii or Herculaneum ruins instead of the hotel). Please contact us with your hotel details after booking. You will be informed about the pick-up time and the coach details. Free transportation is included the price for the hotels in Naples, Ercolano and Pompeii area. If you need a transfer service from a further point, please contact us for the additional price first.